When it comes to offense mixing with art and entertainment, we all have a breaking point. For some of us, it’s criminal in nature, like boycotting the films of Roman Polanski or throwing away our DVDs of “The Cosby Show.” For others, it’s when the entertainer’s statements or actions become too offensive or disagreeable for comfort, like those who have chosen to cut ties with Orson Scott Card or who can no longer laugh at Michael Richards in “Seinfeld.” Still others will bail if the publisher of the entertainment engages in behavior perceived to be unfair to the people who worked on the project, like those who are uneasy about supporting the Edgar Wright-less “Ant-Man” this summer. However, I think it’s fair to say that for most of us, the breaking point comes into play most frequently when something offensive or disagreeable enters into the work itself. There’s nothing inherently wrong with this. “Breakfast at Tiffany’s” is a good movie, but for some viewers, any amount of quality can’t make up for the terrible scenes with Mickey Rooney in yellowface. I can still appreciate the film as a whole, but those people are not wrong for choosing not to watch. The work of Aaron Sorkin is crisply written, frequently funny and occasionally insightful, but there are some who can’t stand his oeuvre due to the misogyny they find baked into much of his work. I like the first four seasons of “The West Wing,” but, again, those people are not wrong. However, I do think that there is one common way that the critical community is taking this breaking point too far: when the perceived offensive content is scrutinized out of context of the work or ballooned to such a significance that the artistic quality of the work is completely ignored. Obviously, there are times when this is understandable. I’ve heard that “Birth of a Nation” is a well-made film, but I don’t have any desire to watch a glorification of the Ku Klux Klan. But there are some pieces of entertainment with far less problematic origins that some in the critical community react against with an overzealous fervor. I’ll give you an example. In December, DC Comics published what was then its most recent issue of “Batgirl,” the 37th issue since the company relaunched in 2011 and the third issue of the “soft reboot” of young Barbara Gordon as a texting, Instagramming hipster with a snazzy hand-made costume and a whimsical life. I was not sold 100 percent on the new direction as the comic began – it was a little too cute for my tastes, just a bit too pleased with itself – but it was telling dense, complete, single issue stories, and the art looked great, so I resolved to stick with it for the first couple of issues. Then issue 37 came out, and I loved it. The cuteness was toned down, Barbara got a good emotional arc, the story was clever and unexpected, and the art, by Babs Tarr and Maris Wicks, continued to burst with energy. But when I started reading about the book online, I began noticing a particular criticism that I hadn’t previously considered: that some elements of the book’s storytelling were considered degrading toward transgender people. The main criticism of the issue centers around the unmasking of a person who has been committing crimes in Gotham City under the guise of Batgirl. When Barbara catches the false crimefighter, the person under the cowl is revealed to be Dagger Type, an avant garde artist/provocateur whose gallery of fake Batgirl photographs was visited earlier in the book. The twist, however, is that Dagger Type is a guy. When the real Batgirl discovers who he is, she reacts in shock, saying, “But you’re a – !” She’s cut off before she can finish the sentence, but the implication is obvious. I’m going to try to show the most key panels so that you can get the context. 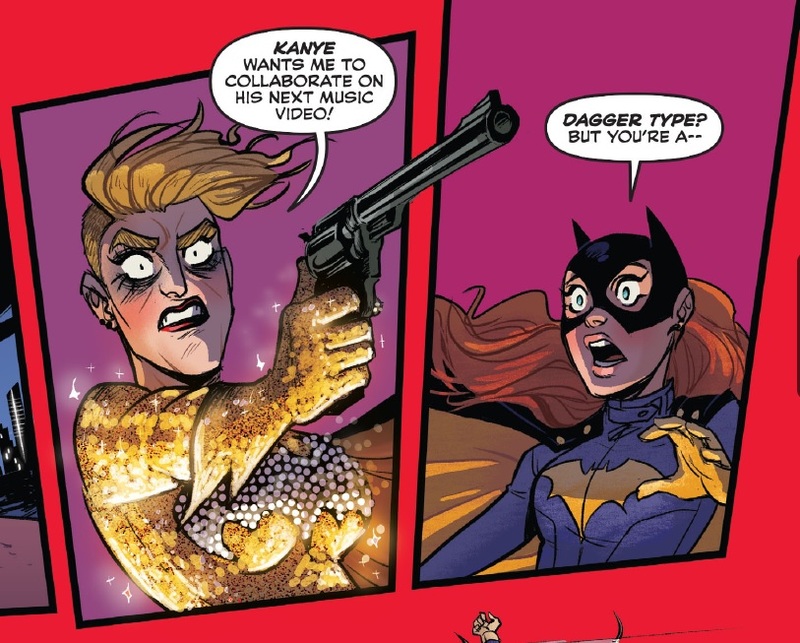 Some reviewers reacted very harshly to this sequence, as well as a later scene in which Dagger Type’s mascara flows with tears as he reels to a crowd’s derisive rejection of his claim that he is the real Batgirl. 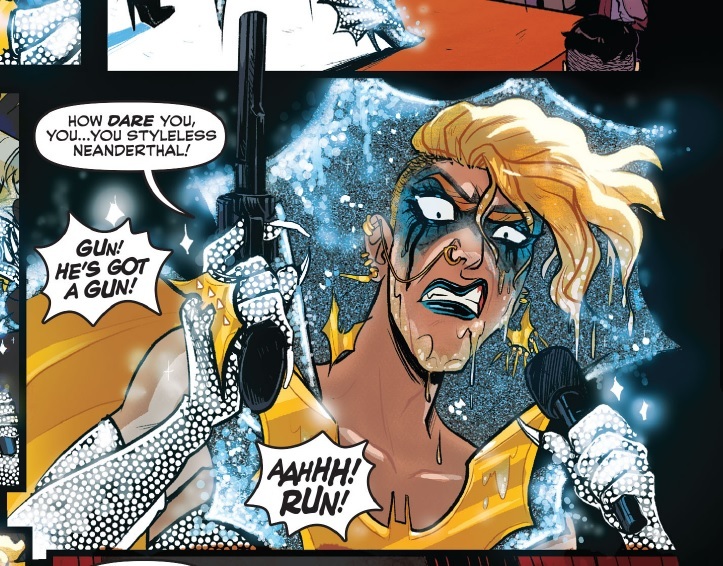 To them, Barbara’s shock at Dagger Type’s appearance represented a rejection of or disgust in non-binary genders, and Dagger Type’s breakdown at the end of the issue leaned heavily on the stereotype of the villainous transgender. For one segment of the comic buying public, those moments were tremendously upsetting. Many demanded an immediate, no-excuses apology or encouraged others to boycott the comic’s creative team in the future. Here’s the other most offending panel. Now, I’ll admit it: I had literally no conception of any of this while I was reading the comic. However, I can certainly see how someone with more knowledge or awareness of these issues that I have could make these connections. But the assertions that the comic should thus not be read or enjoyed by anyone, that it objectively contained displays of transphobia or, as one headline read, “undid a year and a half of positive trans representation”? Those critics removed those moments from the context of the book, and those critics ballooned their interpretation into a condemnation of a comic with plenty of artistic merit. 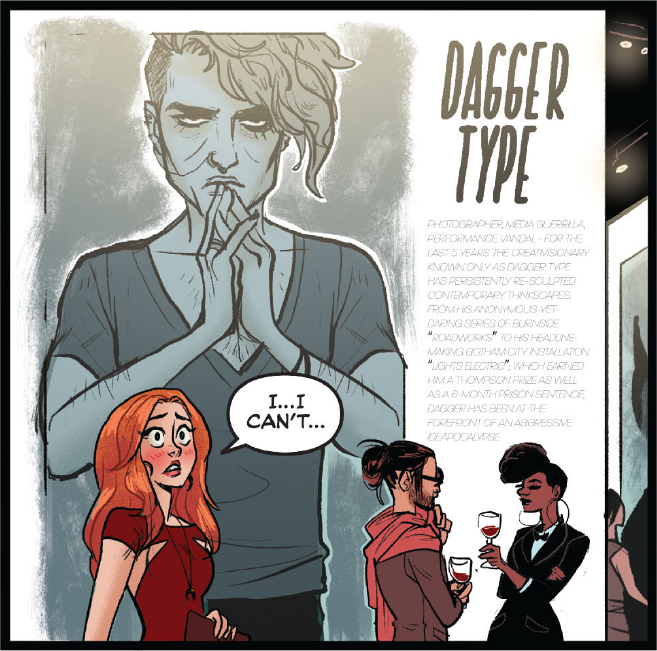 I’ll cop to not knowing as much as some about transgender issues, but I think the main reason I didn’t pick up on the transphobic interpretation is that I never thought that Dagger Type was meant to be portrayed as a trans woman. In fact, it seems pretty clear that he’s not; in his one appearance and mentions in the book prior to the unmasking, he is referred to with the male pronoun, and he is presenting as male. The lone picture of Dagger Type before his unmasking. Similarly, I did not read the later scene as a reliance on the villainous trans stereotype, though perhaps I should have considered it. I interpreted the crowd’s rejection of Dagger Type as a riff on metatextual art and the vapidity that can come from making the artist the subject. “Wait, What’s” Jeff Lester interpreted it as a send-up of the two male writers’ insecurities about taking over from a beloved female creator. I would love to know what the creative team intended to portray with these scenes, but the swift retribution of the all-knowing Internet has guaranteed that any attempt to explain their actions will be met with scorn or dismissal. Considering the team’s rapid apology and inclusion in the issue of a transgender character (as well as other LGBT characters throughout the book’s run), I think it’s safe to say that the transphobic interpretation was not intended. Now, I am not saying the people who were offended by Batgirl 37 are on par with Kubrick conspiracy theorists or the Manson Family. That is truly ridiculous. That so many people came to the same conclusion independently should cause “Batgirl’s” creative team to consider their portrayals in the future. But maybe let’s give some of our creators the benefit of the doubt. Let’s acknowledge that one element of a comic that could be construed as offense is part of a larger whole, one rippling with verve and fun and goodwill. Let’s remember that “Batgirl” is targeting an audience frequently ignored by the Big Two publishers, that it’s a voice for compressed comics in a decompressed comics world, that it’s engaging and evocative. Most importantly, let’s allow ourselves to engage with the issue as a work of art, not just as an unfortunate connotation. Babs is just too cool. Politics and discussions of insensitivity is an integral part of culture criticism. I myself have criticized “Parks and Recreation” for its later seasons’ mean-spirited vilification of the non-progressive. But if the subject of the criticism is not overwhelmed by the questionable content, nor should the criticism of the subject be overwhelmed by the condemnation of the content in question. The blanket condemnation of Batgirl is a few steps up the road from this ridiculous Hooded Utilitarian piece that suggests that almost any attempt to memorialize the Charlie Hebdo shooting victims is inherently racist (see the video at the bottom of this Vox article for a more educational reading of some of those cartoons), but they flow from the same source. 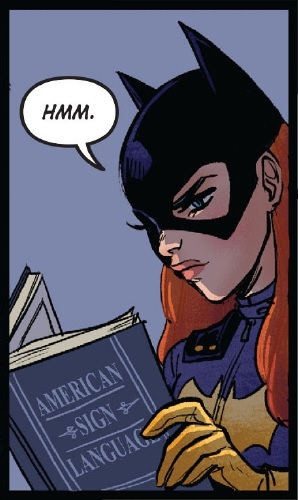 The people who are offended by the contents of “Batgirl 37” are not wrong. But nor are they the only ones who are right.